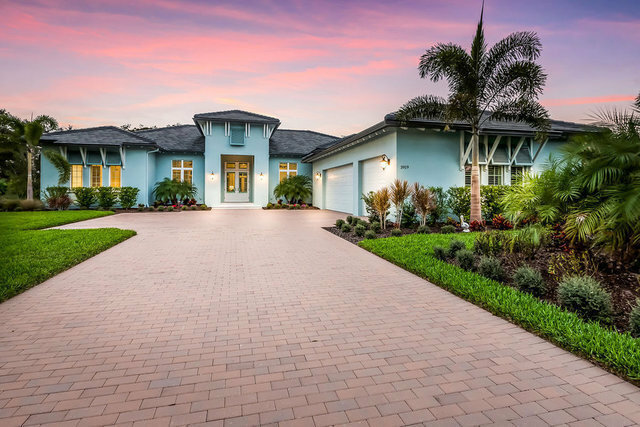 With spectacular lake and preserve views, this gorgeous London Bay custom residence is situated in the finest guard gated community of the Founders Club. Gorgeous golf course community. NO REASON TO BUILD! This home is the LOOK and CHARACTER of TODAY! Beautiful glass entry doors. This home has stunning wood look tile flooring. Gourmet granite kitchen w/ white soft close cabinets, island with sink, Monogram appliances, 6 burner cooktop, glass backsplash, walk in pantry, 3 glass pendant lights over island, large eat in cafe. Cozy study for the working person. Spacious bonus room. 4 bedrooms, three baths with marble counters. All showers have magnificent wall tile details. 8 inch baseboards, solid doors, 14 inch crown in kitchen and great room. Fabulous grand gathering room with French doors and transom windows. Plantation shutters and custom walk in closet systems throughout. Expansive lanai has Shellock pavers. Salt water pool and spa with Pebble Tec finish. Outdoor kitchen, grille with hood, refrigerator, sink, cabinets for storage and 3 ceiling fans. 3 car garage w/ extra a/c walk in storage. Amazing Oak trees on a private lake lot!